Rookie Minicamp Day 1, and "a bust from the past"
The rookies are in the order in which they were drafted.. Frightening, I really need a life, I regurgitated all of those jersey numbers after one read of Garafolo’s morning report. I can’t tell you what I had for dinner last night, but I know DeAndre Wright’s jersey number. And you, what’s your excuse- you degenerate NY Giants football fan, desperate for any scraps at all on these rookies?!! Of these nine players, statistically over the last 10 years (3 to 12 years, draftees from 1997 to 2006), what percentage of rookies become full time GIANTS starters? Try 2 out of every 7. 20 out of 73. 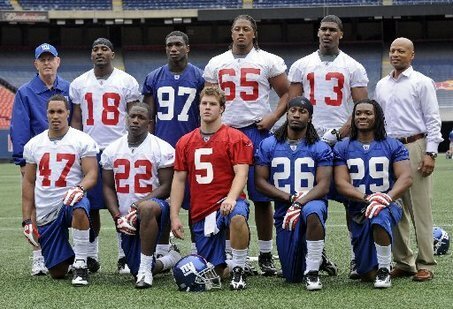 Hilliard, Barber, Garnes, Williams, Petitgout, Griffin, Short, Jones, Allen, Peterson, Shockey, Umenyiora, Diehl, Manning, Snee, Wilson, Webster, Tuck, Jacobs and Kiwanuka. So out of the 9 we have this year, if 3 make it as STARTERS it is statistically a good draft. This could be a very good draft, because it is not that big a reach to see 3 coming from this group. Maybe 4?! But history says the odds are against that forecast- THERE HAS NOT BEEN A SINGLE YEAR (IN THIS SAMPLE) WHERE THE GIANTS GOT FOUR STARTERS FROM A CROP OF DRAFT PICKS. To be fair to the Giants, many organizations fall short of the Giants’ averages. The Giants get 2 per year, and even that is above average. Let’s do a mathematical exercise on expected chances of becoming a fulltime starter for each player. Nicks 80%. That is the run rate of success of our 1st rounders the past 10 years. Only Dayne and Roberts busted. Vacch’s afternoon recap notes an early good look. He’s got GI-NORMOUS hands, love it! Sintim 60%. Our LBer corps is weak or else I’d rate it lower. Beatty 75%. I like his chances because he is in a good organization, will have time to build, the Giants historically have converted their high OL draftees* very well and there is no one else to compete with him (when McKenzie’s body gives out, which should be sooner than later). Barden 50%. Toss up. I love the pick because of the upside but I am a realist. Beckum 20%. Tweener, and I hate tweeners. Are the Giants jumping on this new trend of the Jets’ TE Dustin Keller? Maybe. I should put it at zero as long as Gilbrown is around, because he wastes his TEs and this guy’s “H-back” position will be a ‘role’ position, not a full time starter. 20% is out of respect for Reese. Brown 50%. His chances would be higher if not for the depth at this position. If his film is any indication, he looks like a Giants RB. This was the pick I liked the most (upper right poll), not because of anything else than VALUE. A 50% shot at being a starter from the 4th round.. do you know how high that is? It is my way of going out on a limb and saying the Giants have got themselves another RB who is ‘live.’ When you consider the Giants’ recent success ratio with RBs, it is impressive. Bomar 20%. Wonder thinks 1 injury to Manning 3+ years from now and this kid’ll be our QB. Tough position to succeed at. He’d be 5% normally, but he gets 15 percentage points because Wonder was so high on his value. The fit is right, a team that can groom him, plus a strong arm for the wind of the Meadowlands. 20% is super high. It is more a reflection of Manning’s chances of injury than anything else. Wright and Woodson 5%. Just looked at the stats and Dhani Jones was the only player drafted 6th round or lower to make it as a starter in the past 10 years. 1/20=5%. Add it up, it works out to be 3.6 players expected value. That is a VERY HIGH NUMBER. But to be fair, we thought the Giants had a good draft, and if they get 3 or 4 starters out of this bunch it will be a TREMENDOUS HAUL. *I want to finish off this blog post with a blast ..or rather, “BUST from the past.” Jeff Hatch was one relatively high draft pick (3rd round, 2002) who was a bust right out of the blocks. His agent demanded protection vs injury before rookie minicamp, which made Accorsi and Fassel irate. The peckerwood was already hurt, so this was a smokescreen. He gets his signing bonus before training camp, and then INSTANTLY has a back injury and is finished. How he managed to play the last 4 games of the season the following year (the Giants were 4-8 on their way to 4-12) was probably due to scrub time. At least we did not have any HATCH’d surprises yesterday. This entry was posted on May 9, 2009 at 11:00 am and is filed under Hakeem Nicks, Jeff Hatch. You can follow any responses to this entry through the RSS 2.0 feed. You can leave a response, or trackback from your own site. What about Beckum?? I would say 30% given his injury history and his physique. Yesterday he didn’t start out so well, cramps and all. Sometimes it takes me an hour on the weekends to finish up the post. We agree, I put him at 20%, we are on the same page. All I can say is holy crap, would you look at Barden in that photo? He is freaking huge, almost as big as Beatty. Look at Nicks and poor Sintim next to them — I don’t know how Sintim is big enough to play LB when there will be guys like Barden on the field. Ramses, indeed. S Michael Johnson is starter out of the 7th round. Anthony- We surveyed 1997 through 2006 to allow for three years in the league. 2007 and 2008 were not used because we did not want to lower the result. But 2007 has a chance to blow the doors off… Ross, Boss, Johnson. Then add Smith this season and if Jacobs gets hurt ..Bradshaw, that would be 5, almost unheard of statistically, and (as mentioned in previous posts as often as we can) a major reason why the Giants won a Super Bowl title.